New data from the latest survey by the Pew Research Center’s Internet Project in the spring shows that 85% of Americans adults use the internet at least occasionally. Five years ago, in an April 2008 survey, 73% of adults used the internet. Ten years ago, in May 2003, 63% of adults used the internet. At the same time, those ages 65 and older, Hispanics, those living in households earning less than $30,000, those without high school diplomas, and those living in rural areas are not as likely as others in the adult population to use the internet. A majority of those ages 65 and older (56%) use the internet. It has been about a year since senior citizens cracked the 50% threshold for internet adoption. Mobile connectivity through smartphones and tablet computers only adds 2% of unique internet users to the overall population. At the same time, we have reported from previous surveys that a portion of mobile device users are “cell mostly” – that is, they do most of their internet browsing through a mobile device. We are doing more analysis of these new data to determine new levels of “cell mostly” activity and will report on them in the coming weeks. Last year, we reported that 31% of internet users are “cell internet users” (those who use their phones to go online) and 17% of all cell phone users are cell mostly. We also reported that 25% of teens are cell mostly. 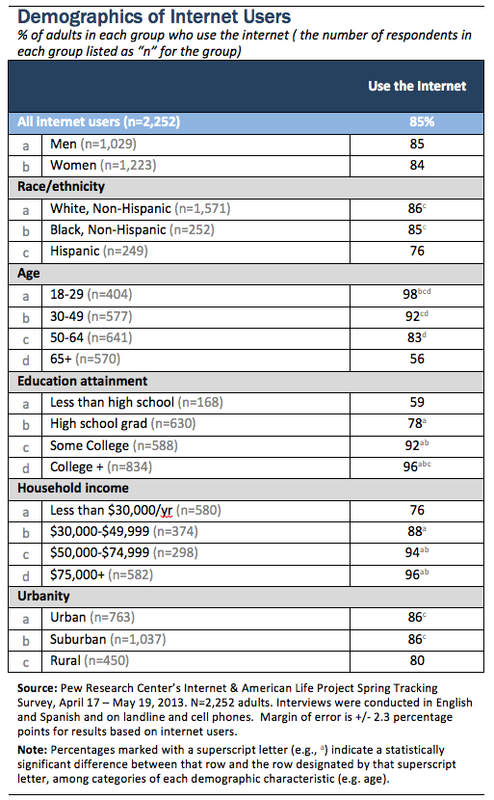 Parents of minor children are significantly more likely than non-parents to be internet users (93% vs. 81%).